SangomaBeat weaves West African rhythms with ethnic vocal arrangments and harmonic guitar riffs into tribal world grooves. SangomaBeat music means multicultural drumming, ethnic rhythms and ancient songs. Audiences enjoy our songs and love to dance to our rhythms. Besides our "Magical Drums" show we offer drum circles, workshops and African dance classes. 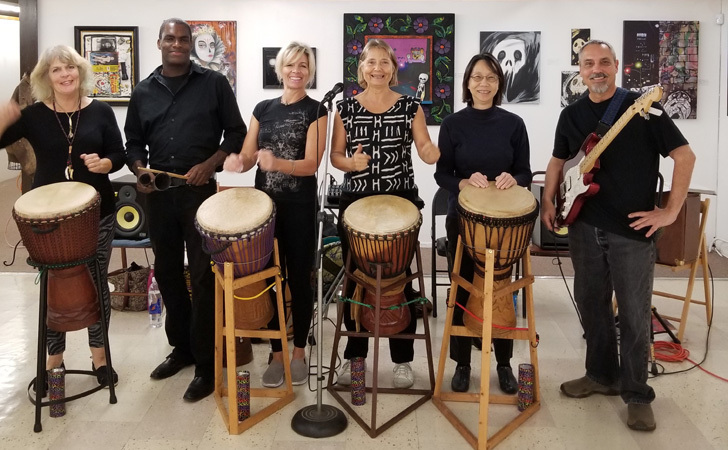 SangomaBeat has performed such varied venues as Brand Library in Glendale, Kathmandu Boutique, Pacific Design Center, City Festivals of Manhattan Beach, Culver City, Fontana and Beverly Glen, Colleges like Fullerton, Cal State Northridge and Chapman University in Orange, Yoga Studios (LiveYoga Wellness, Happy Me Yoga, Golden Bridge Yoga, Yoga Sofia, Yoga Loft), Schools, Pre-Schools, Cafes, Clubs, Churches and Drum Shops (Motherland Music, Synergy Cafe, Forbidden City, Temple Bar, Unity Church of South Bay, The Rose Temple), Retirement Homes in Anaheim and Garden Grove and was featured on the TV Show Talking Drum.